The first in a new class of Russian guided missile frigate arrived on Thursday to Sevastopol marking the first time the Black Sea Fleet has seen a new blue water warship since the end of the Cold War. 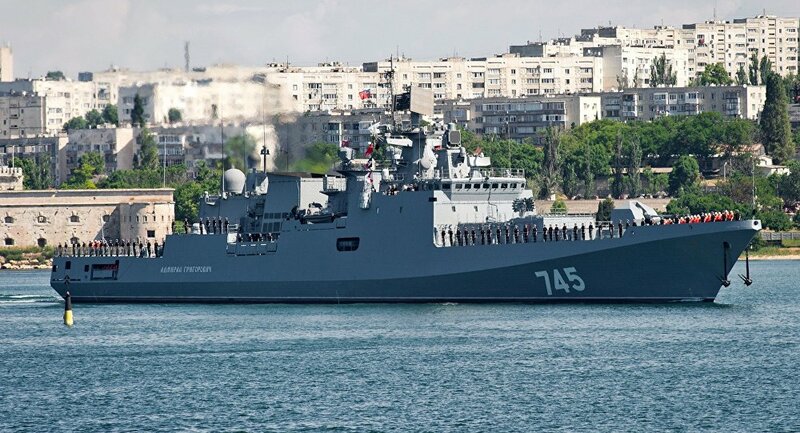 The Project 11356-class Admiral Grigorovich arrived in Crimea, the first of several new surface ships the Russian Navy intends to base in the Black Sea. “This is the first vessel for distant water operation, which the Black Sea Fleet has received over the past 35 years,” fleet spokesman Vyacheslav Trukhachyov told the TASS news service. The 4,000-ton frigate delivered to the Russian Navy in March and is the first of a planned class of six based in the Black Sea. Based Talwar-class frigates that Russia built for the Indian Navy between 2000 and 2013, the Grigorovich frigates are built as a multi-mission surface combatant and can handle submarine, air and surface threats, according to information from the Russian defense ministry. The frigates also field the Russian Kalibir NK long range land attack cruise missiles – first used operationally last year from Russian Navy ships in the Caspian Sea to strike targets in Syria. The ship’s arrival is part of a planned $2.43 billion expansion of the Black Sea Fleet, announced in 2014. Eric Wertheim, naval analyst and author of U.S. Naval Institute’s Combat Fleets of the World, told USNI News on Thursday the frigate’s arrival in Crimea was a win for the Russian Navy. “This shows that Russia’s plans to modernize its naval forces are starting to pay dividends,” he said. Prior to the new frigate, the Black Sea Fleet was populated by mostly 1980s era surface combatants and newer but smaller patrol craft. The new push to refresh its surface forces might be difficult to sustain. For instance, since Russia invaded Crimea, Ukraine has refused to supply maritime gas turbines for new Russian surface ship construction. Russian ship builders have also been plagued by construction delays. “The long term question remains one of sustainability. Can their forces maintain this level of modernization and increased operations and capability in the decades ahead? It will take years to get an accurate answer,” Wertheim said.